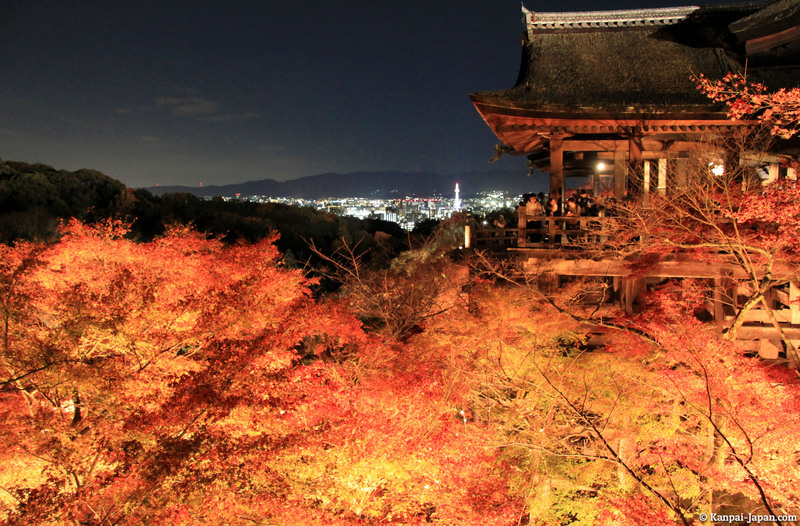 Kiyomizu (which means "pure water"), apart from being a UNESCO World Heritage Site, is another essential visit to plan during your trip in Kyoto. 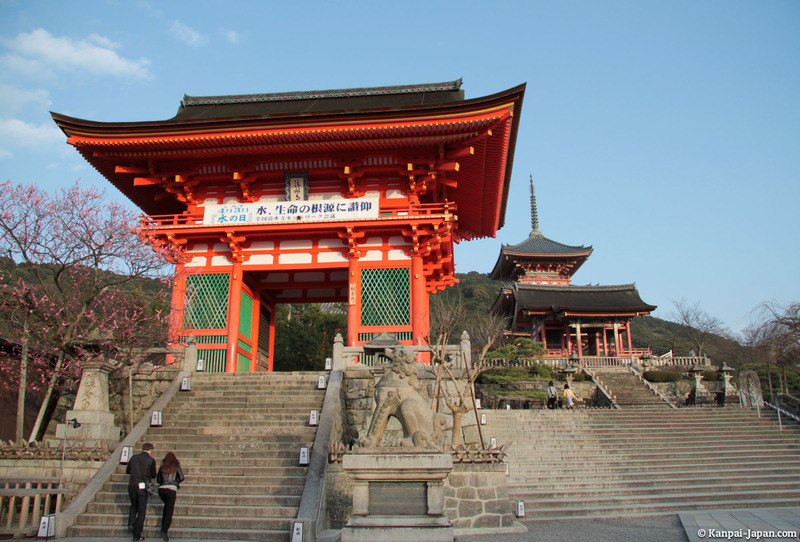 Located east of the city, this gigantic Buddhist area, located on the mountainside, is best known for its majestic main temple: Kiyomizu-dera Hondo (as seen on the main picture of this article). 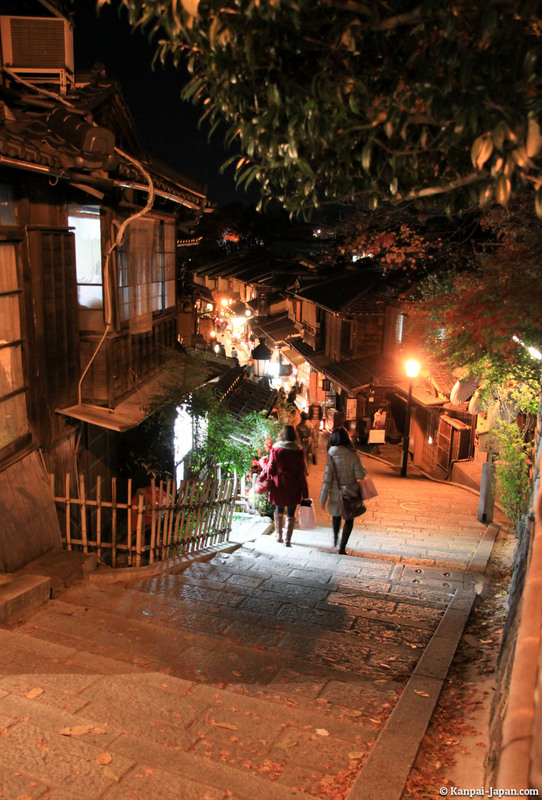 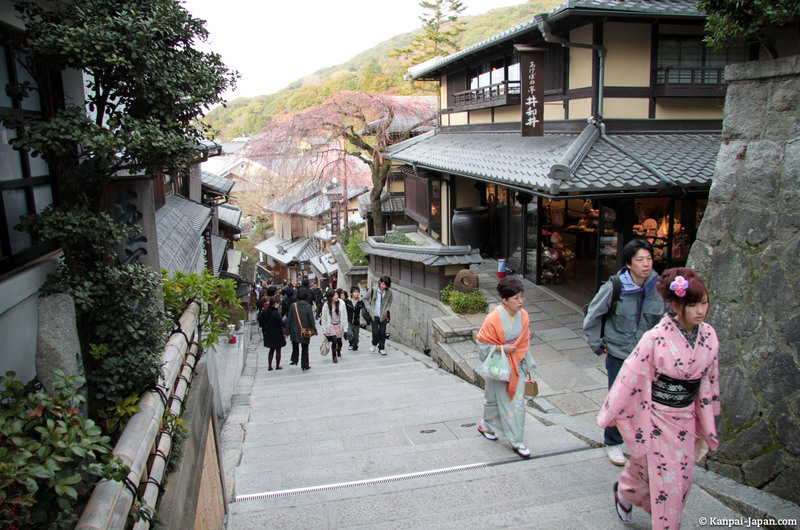 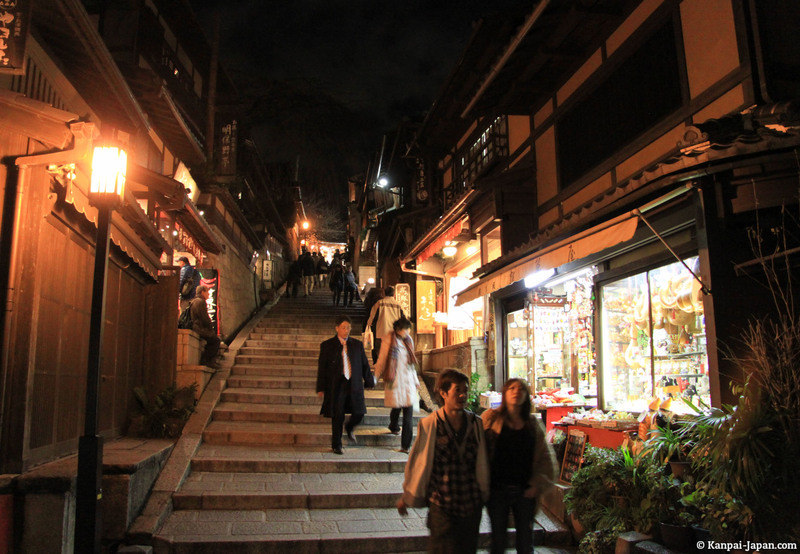 But the walk begins with Kiyomizu-michi and its shopping streets, in which also hides a Ghibli goodies store! 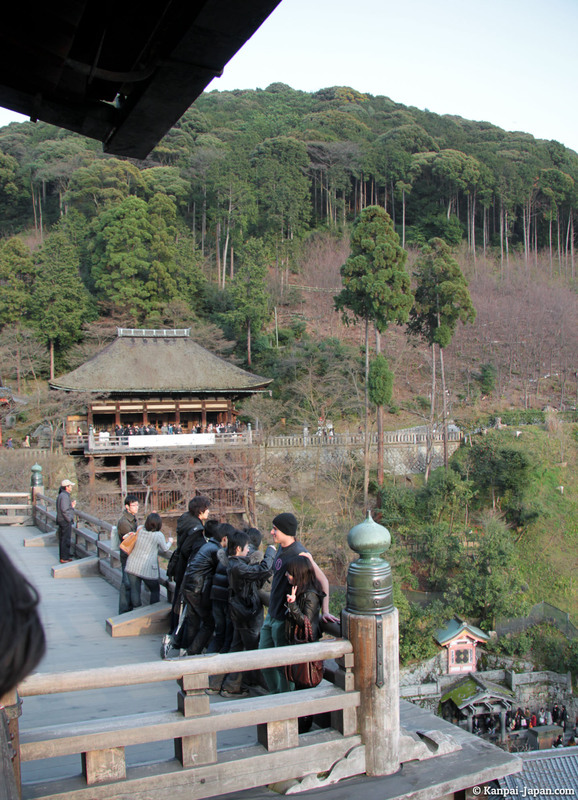 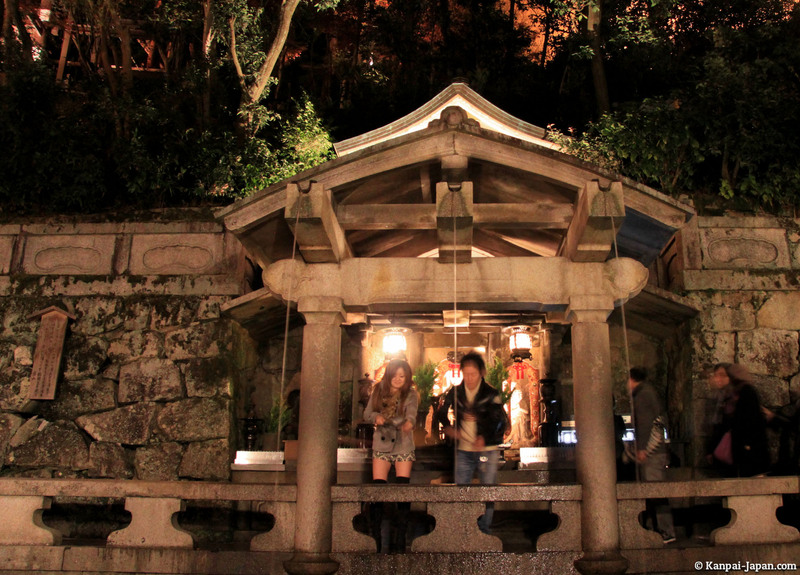 The entrance to Kiyomizu-dera costs 300 Yen. 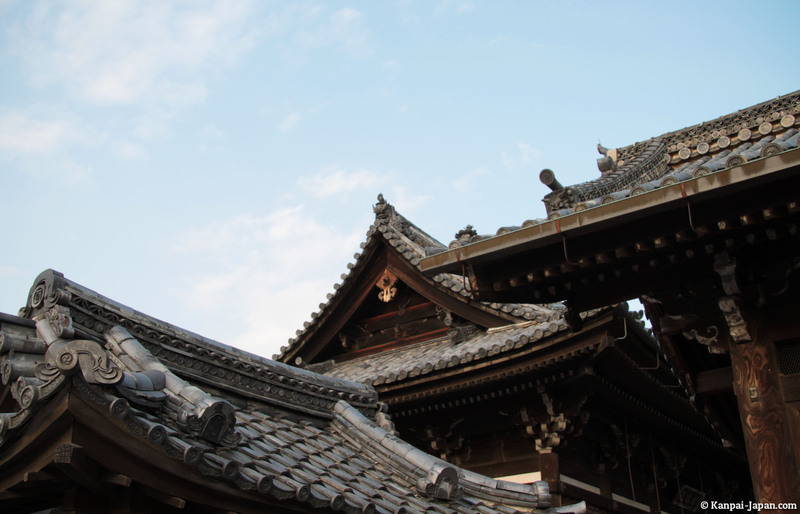 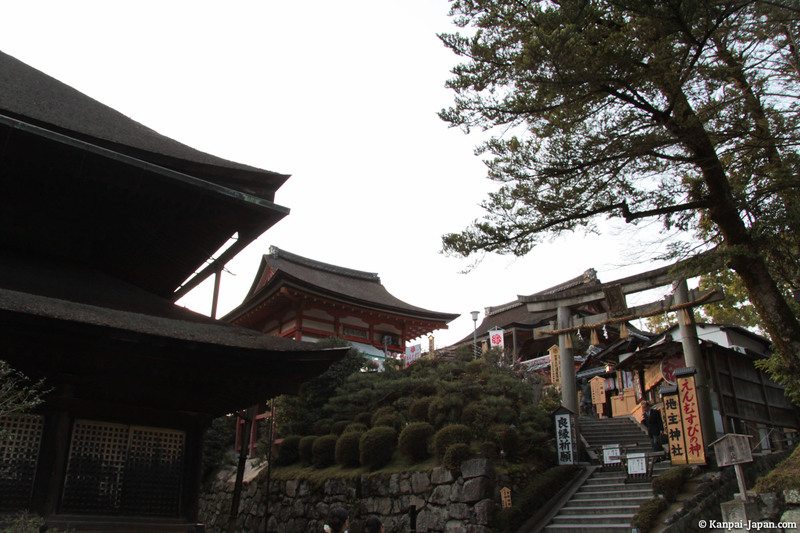 The complex consists of several temples, pagodas, and even a waterfall (Otoma), all built around the main lodge. 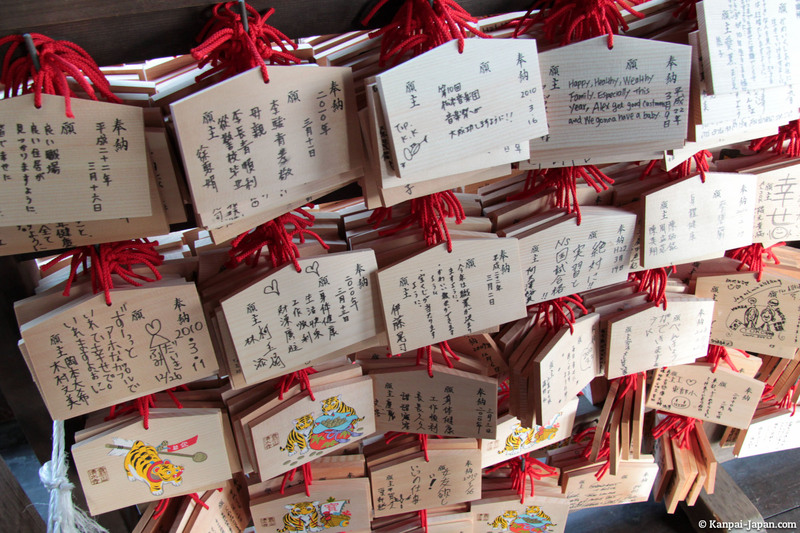 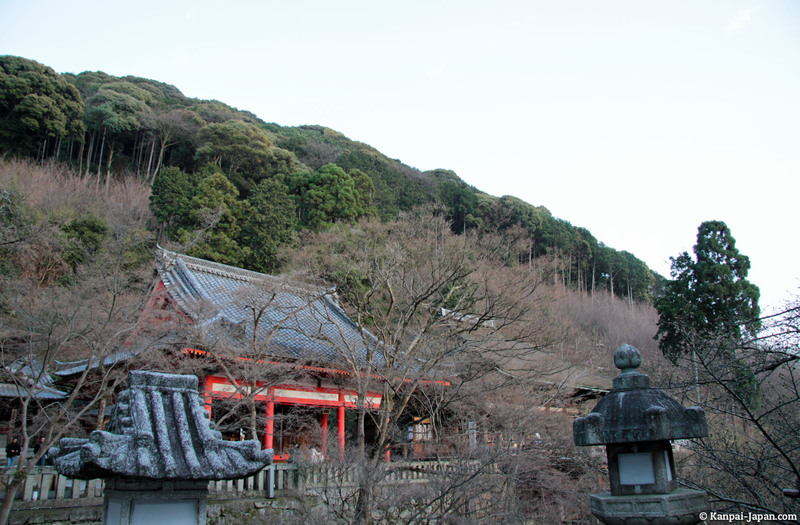 There is even a Shinto shrine, Jishu-jinja, dedicated to love. 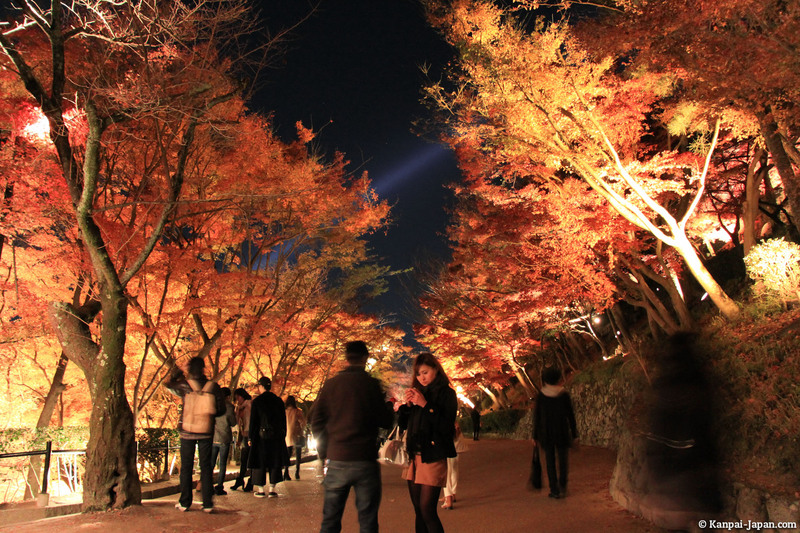 The photos accompanying this article were taken in March, but the visit is especially recommended in April (to see sakura - cherry blossoms) and November (to see momiji - red maple trees). 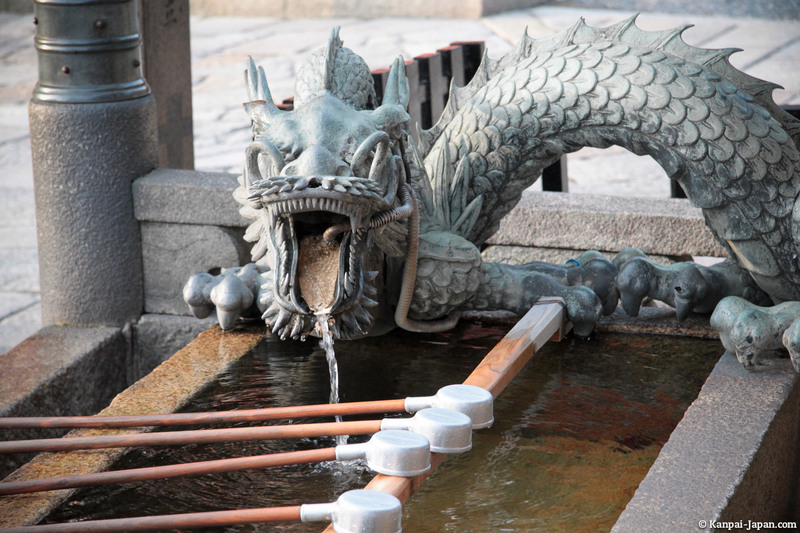 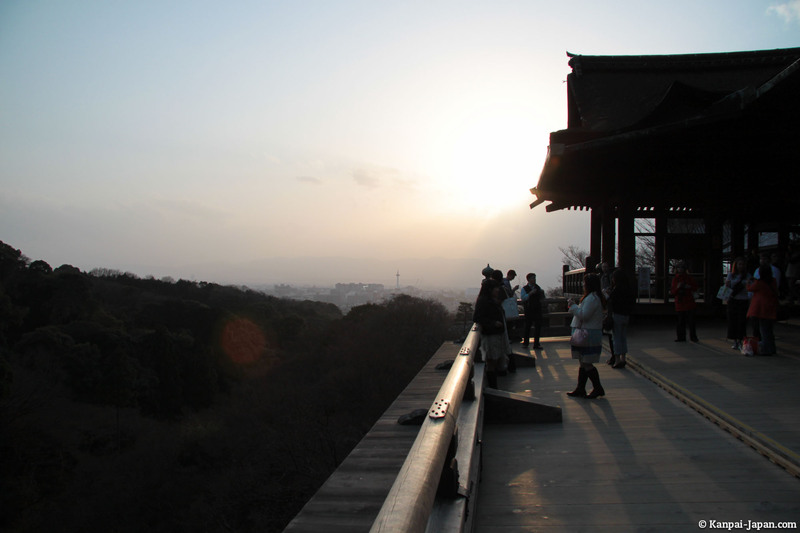 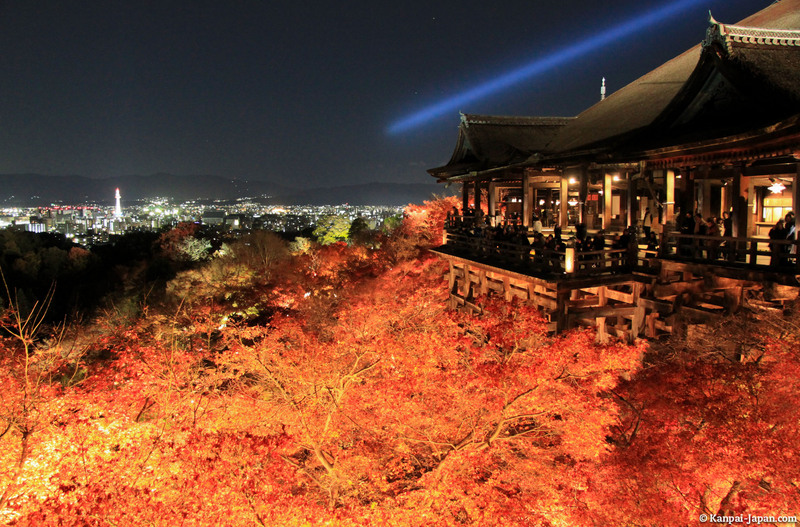 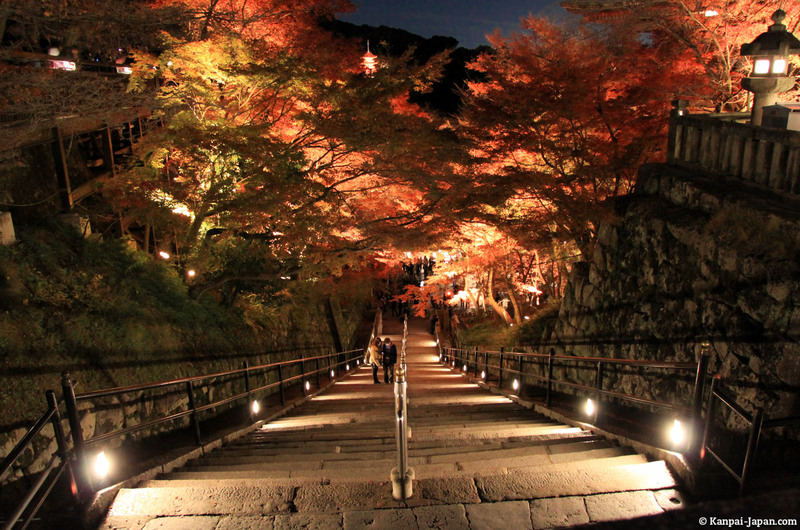 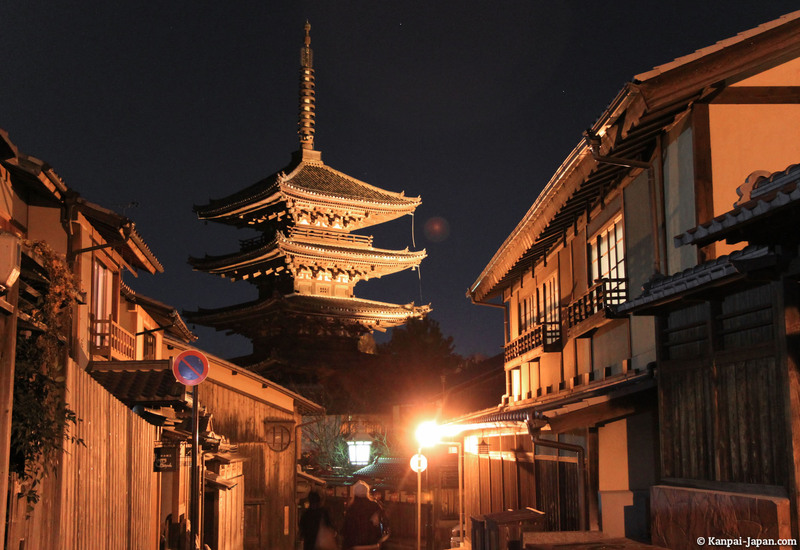 The Kiyomizu-dera is one of the inevitables in Kyoto. 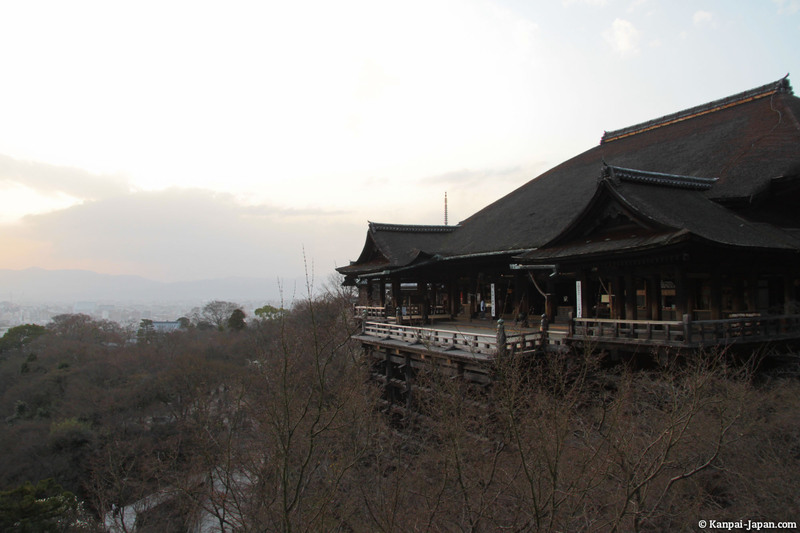 This set of majestic temples, including the magnificent main hall, as well as the walk around a relaxing panorama are very enjoyable. 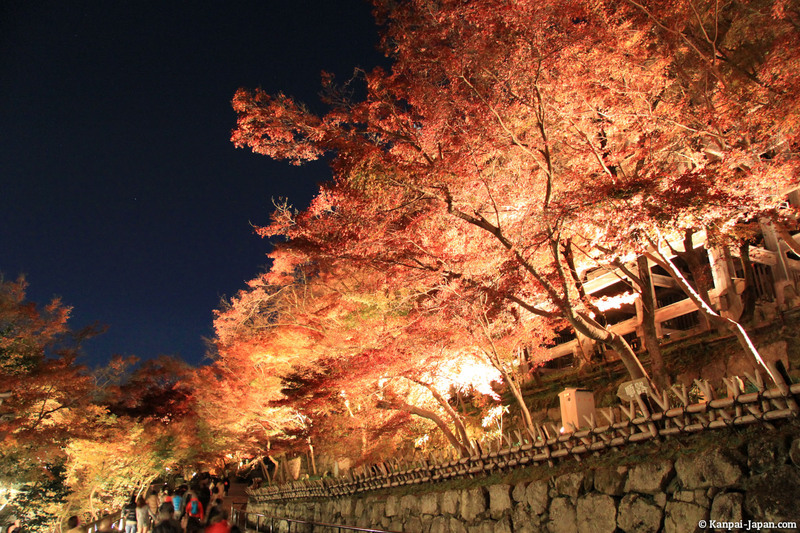 Twice a year, the temple organizes a special event: for sakura (cherry blossoms) during spring and for momiji (red maple trees) during fall. 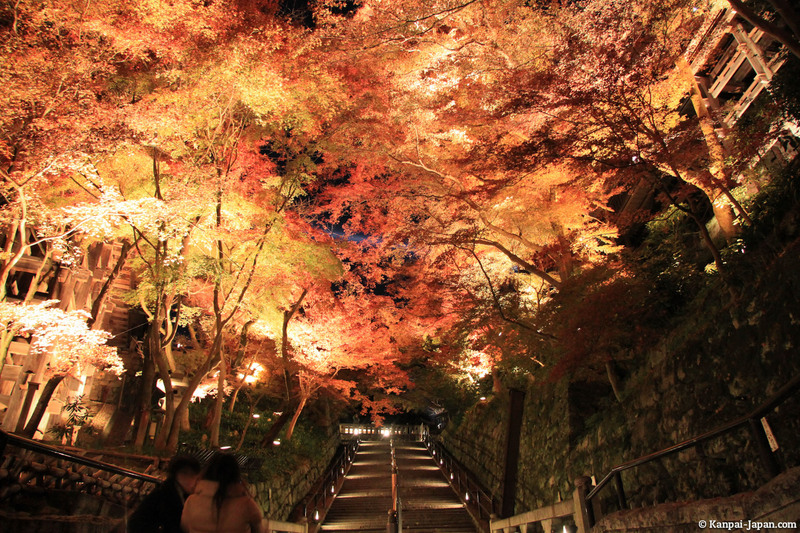 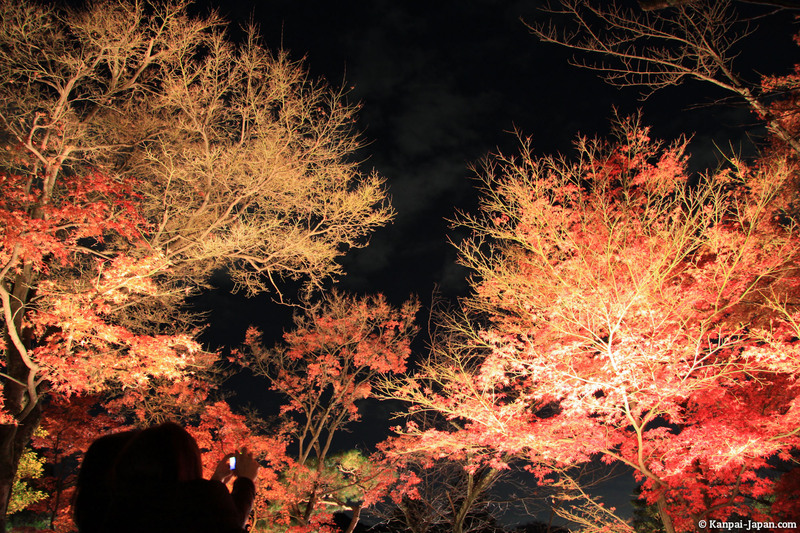 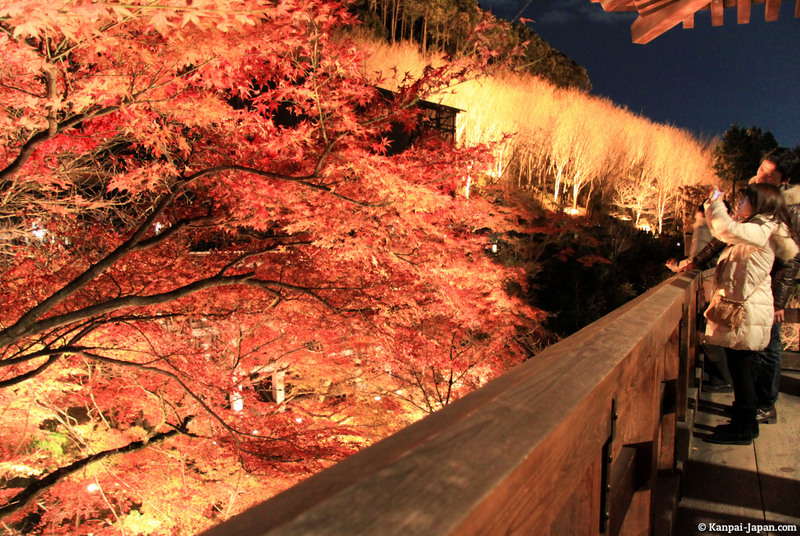 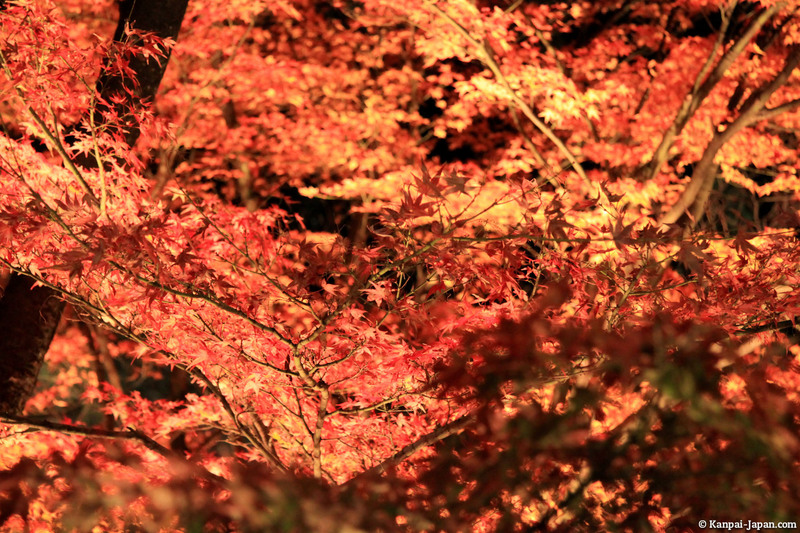 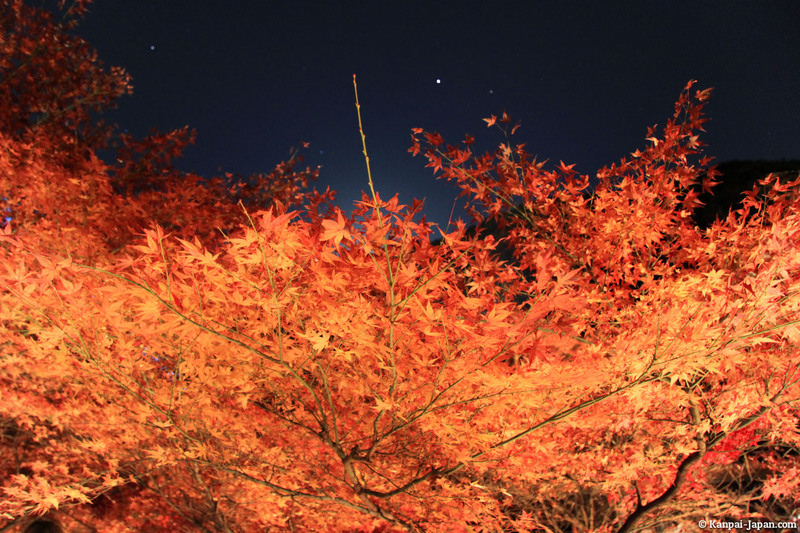 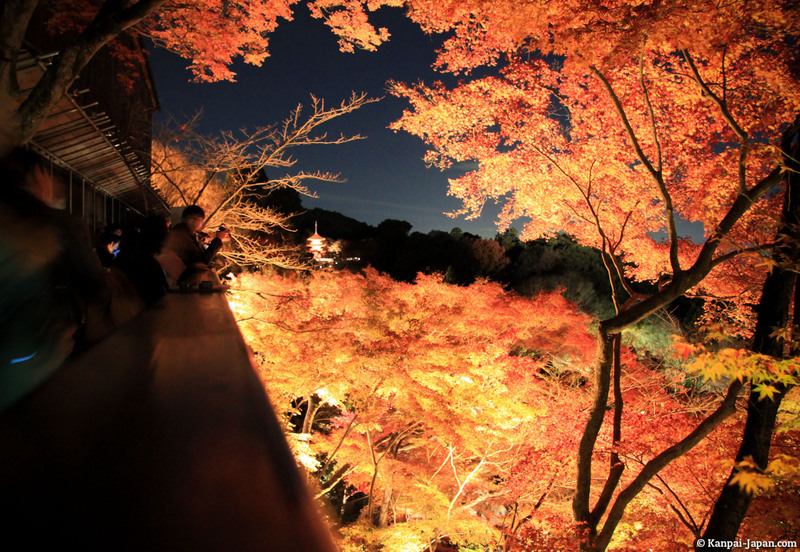 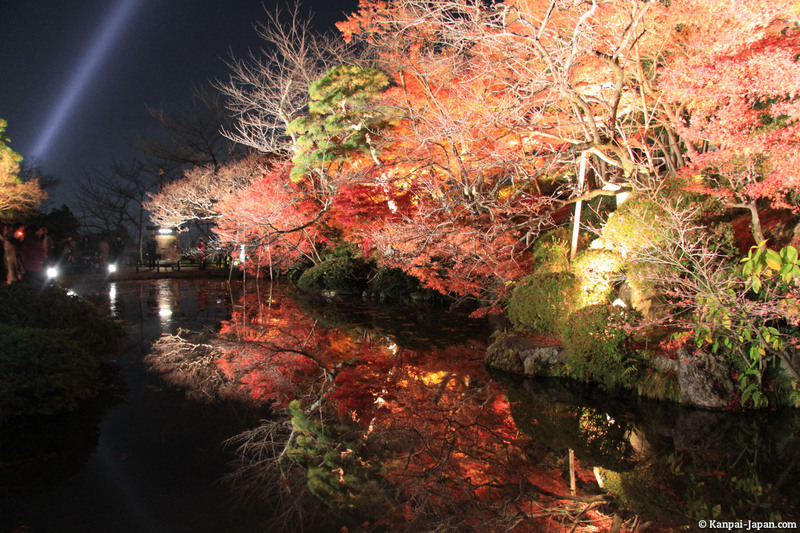 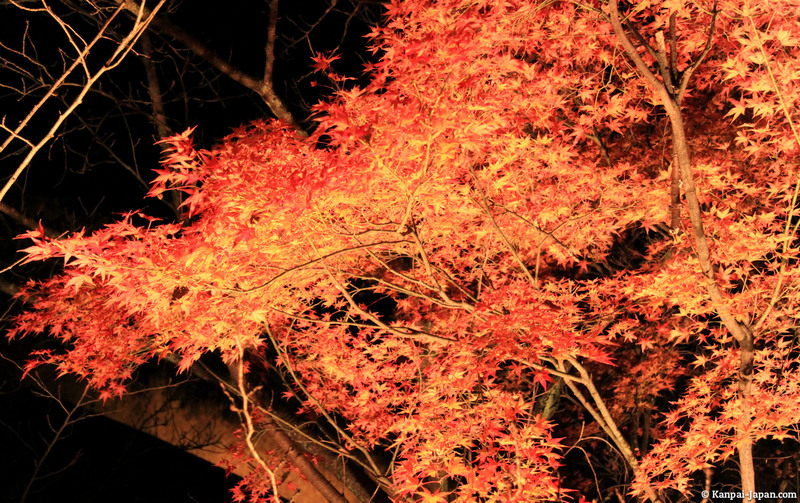 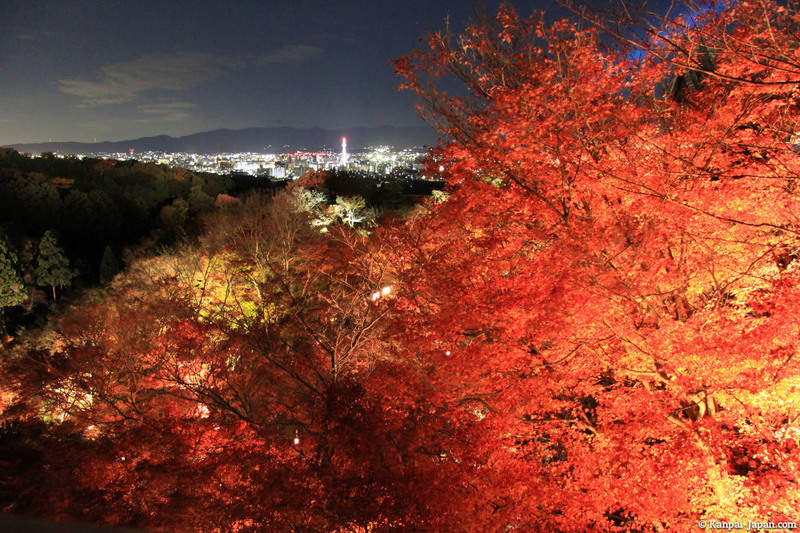 We had the opportunity to visit Kyoto during this period when the maples are decorated with a gorgeous red and I wanted to view them through the night. 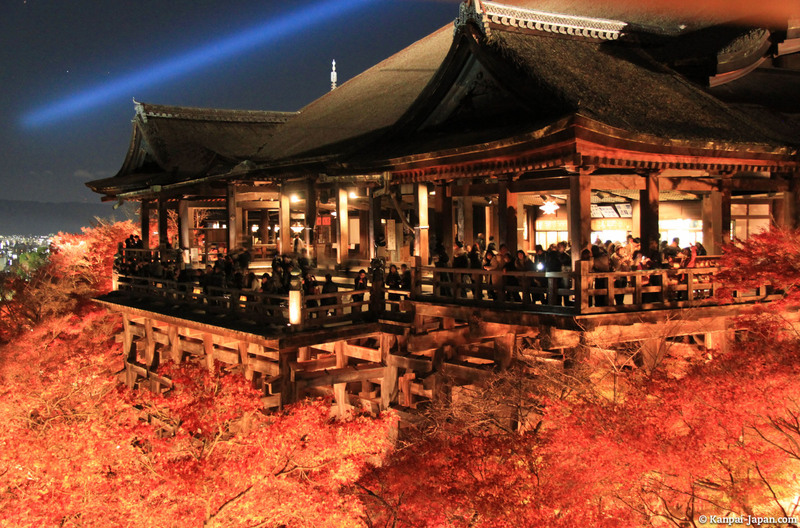 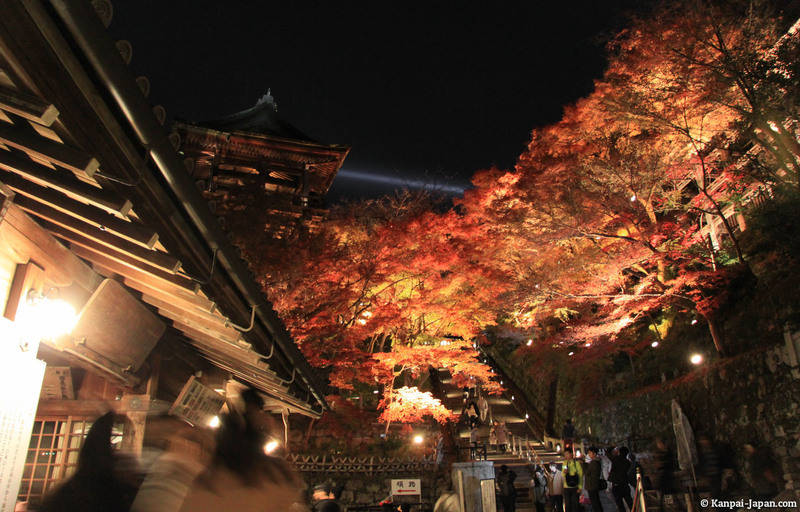 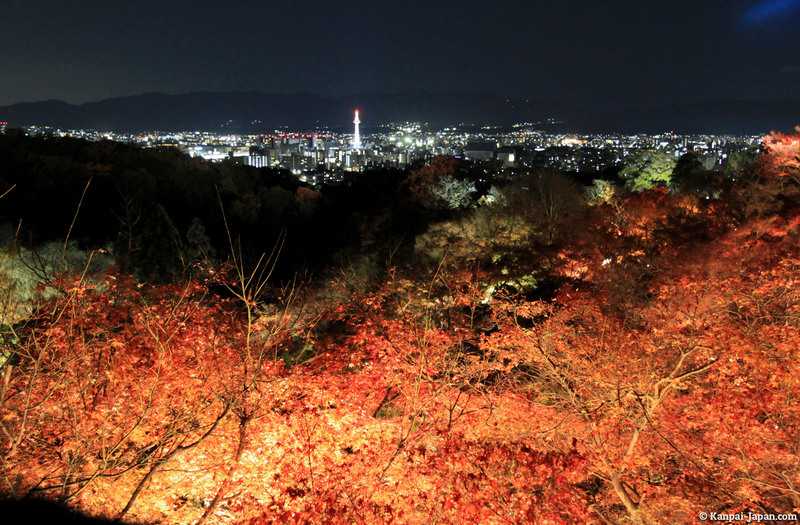 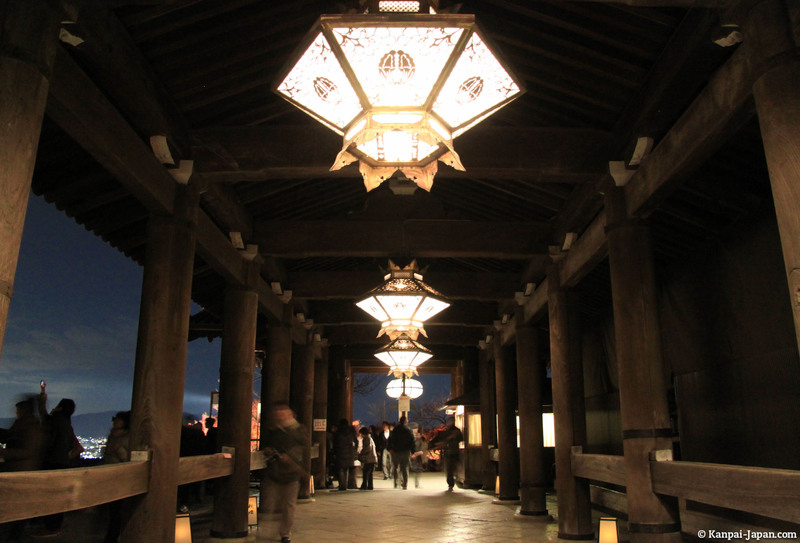 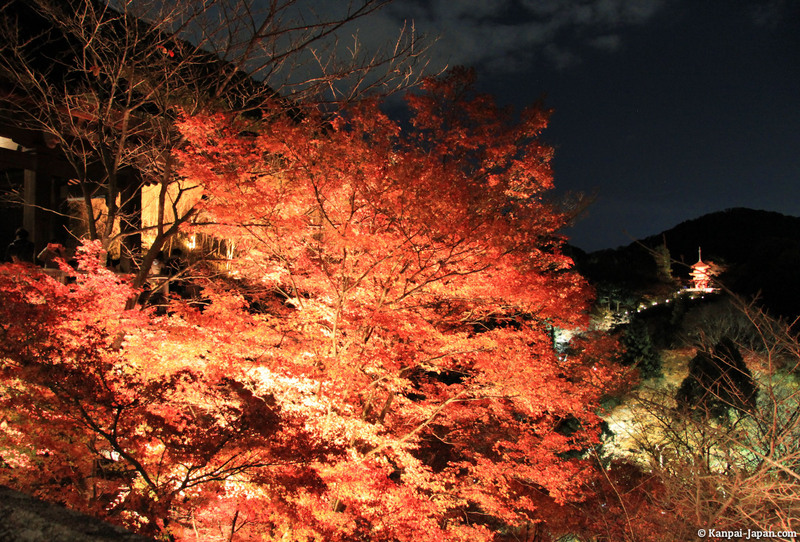 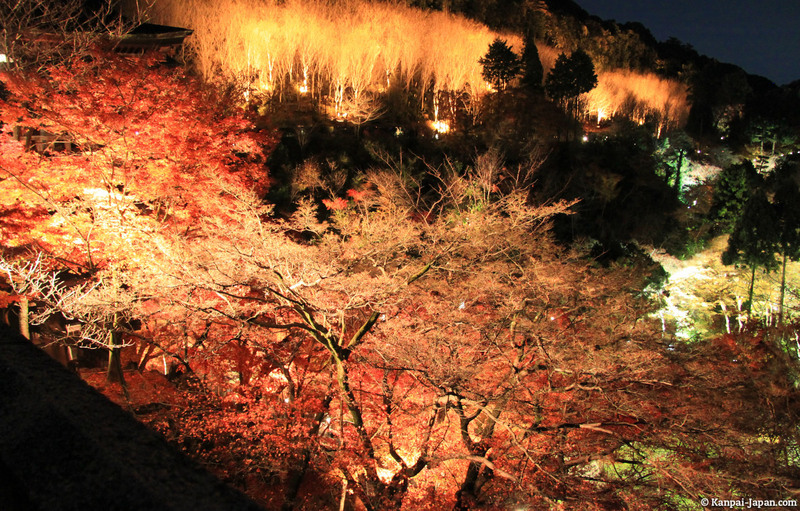 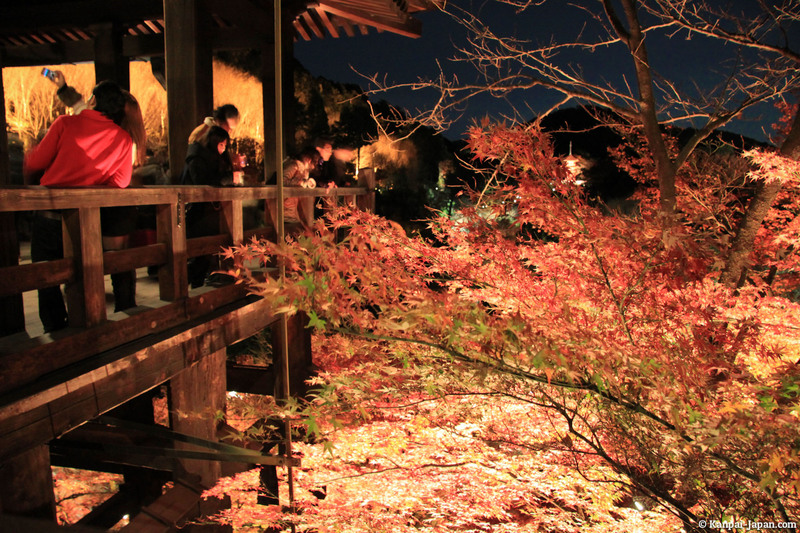 From mid-November to early December the Kiyomizudera, like other temples in the city, take advantage of the special opening to perform what they call a "light-up" to place the entire visit in the dark and light only strategic spots (mainly on the temples and trees). 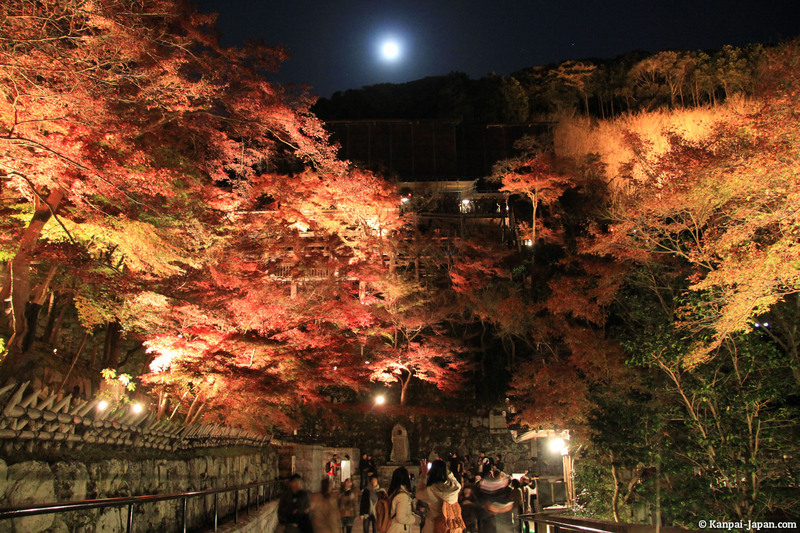 Note: These special events are obviously very popular among locals and tourists who don't hesitate to clump and wait for hours to see the momiji. 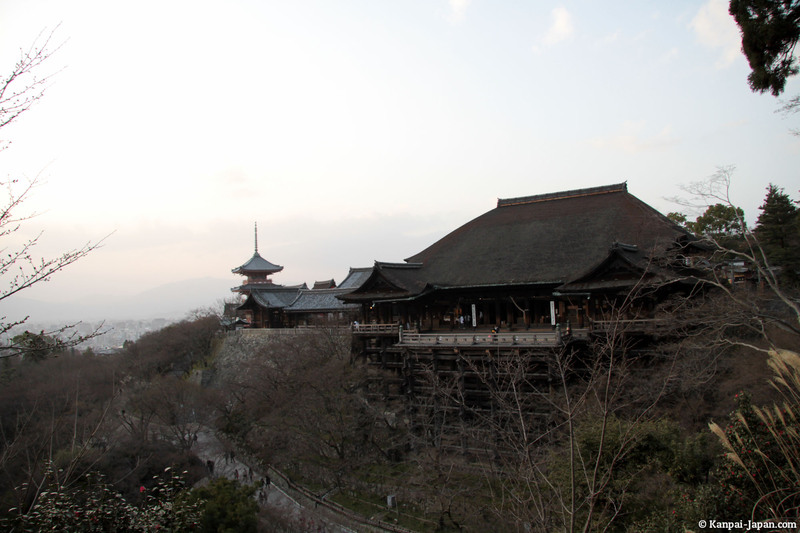 Fortunately, the Kiyomizu-dera is one of the largest temples in Kyoto. 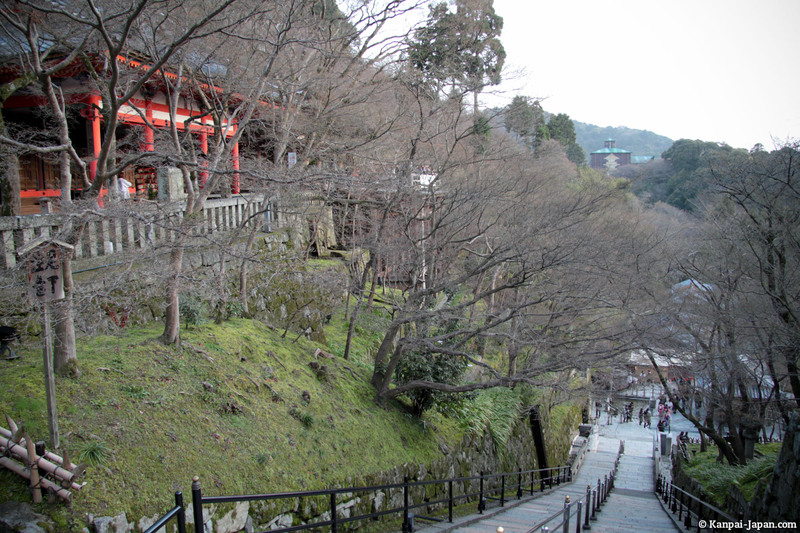 It will still be kind of a challenge to visit it quietly and without anyone on your photos. 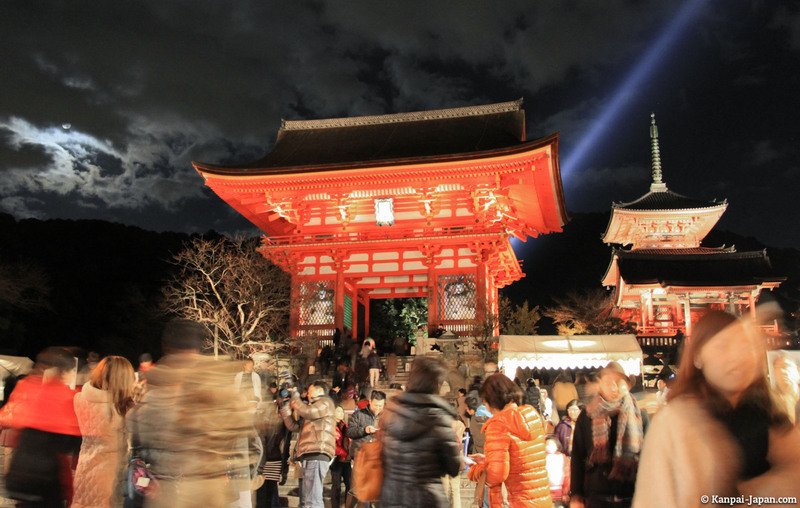 Especially as the tripods, which are essential for shooting in the dark, are quite unappreciated by the temple staff. 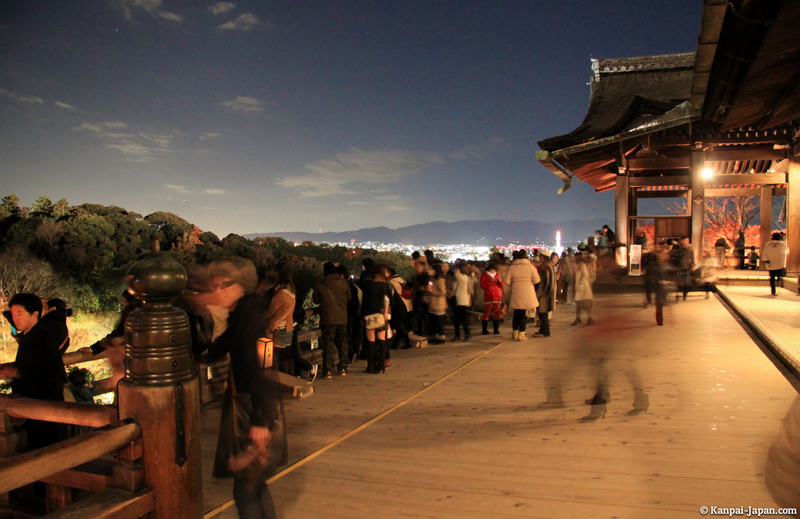 Open daily from 6 a.m. to 6 p.m.